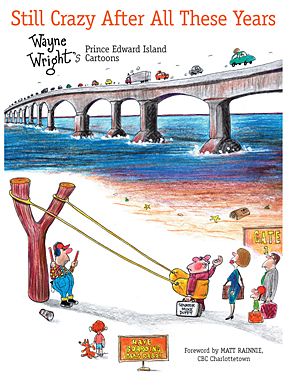 Wayne Wright has been drawing editorial cartoons in Summerside, PEI’s Journal Pioneer daily newspaper for 35 years and this collection reflects the best of his environmental, political, sports, and “Island way of life” cartoons in that time. In addition to making us laugh at ourselves, he occasionally stirs up a tempest. The former mayor of Montague, Pat McGowan, threatened to haul him up before a United Nations Human Rights Tribunal for his series of cartoons about her outlawing dogs riding in the back of pick-up trucks in Montague. Another reader thought Wayne should be publicly flogged for one of the many cartoons he’s drawn about Summerside Mayor Basil Stewart. But his cartoons also warm our hearts. Wayne reached his largest audience after 9/11 in New York, when late night TV host David Letterman held up Wayne’s now-famous Twin Towers cartoon, in an attempt to cheer up a devastated America. In his Foreword, CBC Charlottetown radio host Matt Rainnie said that he relies on Wayne’s cartoons to identify what Islanders are talking about each day at their kitchen tables and in the coffee shops, be it curious municipal by-laws, windmills, rock stars or roadwork.